Hurricane and Hurricane HD are tracking Hurricane Isaac in the Caribbean as he moves toward the Keys and into the Gulf of Mexico. Get the latest information, with the intuitive mapping experience so many other people have come to know and trust over the last 5 years. As a Top Paid 100 App in the iTunes App Store each time a storm approaches, you know you can trust Hurricane to get the information you need to you, when you need it most. 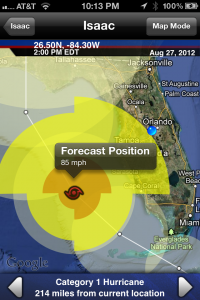 Pick up Hurricane and Hurricane HD in the iTunes App Store, and start tracking with us today!